Oh man, this may be the last time I try to read one of these books-based-on-books-that-I-already-love. 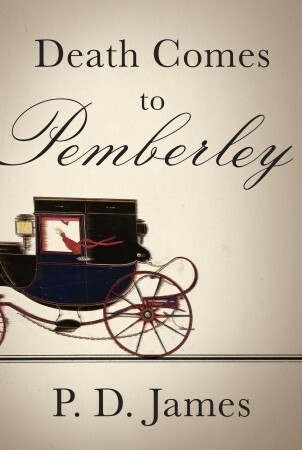 The first chapter or so of Death Comes to Pemberley was awesome. The rest was pretty much crap. First boring crap where nothing really happened and then implausible crap that made me want to punch P. J. James (who is apparently, NOT a man, as the Southwest employee told me rather emphatically as I was telling her about my opinion of the book) in the throat. I am not sure why I thought that this wouldn't be disappointing, maybe because they advertised it on the back of the New Yorker, maybe because Lydia is secretly my favorite Bennett sister (I am a big fan of doing things just for the story, as is she - trust me). But this was a mega let down. Speaking of Lydia, for some reason as I read this book, I was not picturing Colin Firth or Kiera Knightly or anyone EXCEPT I could pretty much hear Jena Malone reading Lydia's dialogue in my head. Say what you will about her as an actress, but clearly she leaves a lasting impression. Of all the things that pissed me off about this book (and there were MANY) - the thing that got my goat the most? The cross over business between the books (I won't ruin it and tell you how it affects the story, but I feel like you have a right to be warned against such atrocities). I am not quite sure who died and named P.D. James queen, but there needs to be a coup d'etat. Pronto. You cannot just wave your magic freaking quill pen and connect imaginary dots between Emma, Pride and Prejudice and Persuasion. You. Can. Not. I do not care how many old ladies think you're really great. Thank goodness it was over quickly. And for the record, I knew who did it all along.